Pontypridd RFC is proud to announce a brand new online digital lottery making it easier for you to pick numbers and pay on your phone. We are proud to be in partnership with DIGI4 who have developed a brilliant app that has helped many clubs revolutionise their existing lottery. The launch for the lottery is this coming Saturday 6th October with the first draw will take place on Sunday 21st October 2018 at 12.30 and the prize for the first draw is £1000. DIGI4 is an online app available in the Apple Store for you to download and will this will allow users to enter the lottery draw from anywhere in the world providing you have access to the internet and have downloaded the app. 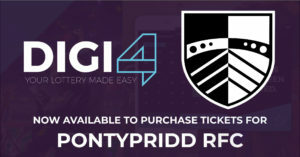 Users will have access to Pontypridd RFC’s lottery which operates the 4-number system whereby a player chooses 4 numbers between 1 and 24 and in order to win the jackpot all 4 numbers must be matched. Users will have instant access to Pontypridd RFC’s draw, key information and lottery results. At present, the app is only available at the Apple Play Store. However, any users wishing to play that don’t have access to Apple products, fear not, as our very own newly appointed Club Director Paul Marshall will be available at the clubhouse this Saturday 6th October from 1pm until kick off, and then after the game until 6pm for you to come along and purchase tickets. * Easy to access draws with a push of a button. * Save debit card details that are safe and secure. * Save your most used numbers. * Set and edit reminders that update you on your chosen draws. * See previous draws, active and upcoming draws. * Get notifications for winning numbers. * Set reminders and notifications.